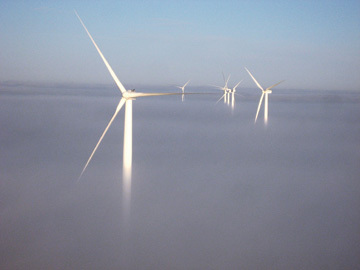 The Wind Capital Group has used Suzlon turbines on several of its projects, with Alliant Energy Wind Connect being the general contractor. The company currently has over 2,000 MW of wind power in development in the pipeline in a dozen states. The Wind Capital Group started operations in 2005 and already has four wind power projects completed-including a project that makes the Missouri town of Rock Port the first community in the United States to be able to supply all its electrical needs from wind power. When lawyer Tom Carnahan noticed there were no utility-scale wind projects in his home state of Missouri he was curious to find out why. He found the answer was simple-no one had ever tried it. "Because Missouri had been overlooked by developers, there was a sense here that it just couldn't be done," says Carnahan. "But when you peeled back the layers a little, it became apparent that it was possible." In 2005, Carnahan gave up his 10-year law practice to start up Wind Capital Group (WCG), of which he is currently president. At the time, people were extremely skeptical-including his mother, Jean Carnahan, a former U.S. Senator (Tom is also the son of the late Missouri governor, Mel Carnahan). "I would tell people what I was working on-that I was going to build a wind farm-and it was usually received with sort of a stunned silence, or people just started to think I was crazy," says Carnahan. "There were comparisons to Don Quixote. My mother actually gave me a Don Quixote statue that I keep in my office to this day." Carnahan went through the methodical process of achieving site control, getting both on-site and computerized analysis of the wind regime, and making the case that the project would attract investors. Eventually, Carnahan won over the skeptics. "It required enthusiasm, energy, focus and partnership with people that bought into it and said, 'We want to make this happen.' And that's what occurred." The very next year, WCG and its partners completed the Blue Grass Ridge project, providing Missouri with its first wind farm. "The landowners and the community were key," says Carnahan. "And John Deere Credit brought the financing and turbines that they had secured under an existing turbine supply agreement. And our power off-taker and interconnection was with Associated Electric Cooperative, which is similar to the parent wholesaler of the Missouri rural electric cooperatives." Of the partners, John Deere was the first to step up to the plate. "The stars were aligned as far as that goes," comments Carnahan. "They had turbines that they needed to commit that were going to be delivered in the time period that our project would be constructed. They were also close by and farmers in the local communities knew the name-there was goodwill that went with that." Bluegrass Ridge - Gentry County, Missouri The company's first project, it began in June of 2006. The wind farm erected 27 Suzlon S88 turbines, each with 2.1 megawatts (MW) for a total project size of 56.7 MW. The electricity produced can provide enough "green energy" to power about 16,000 homes. 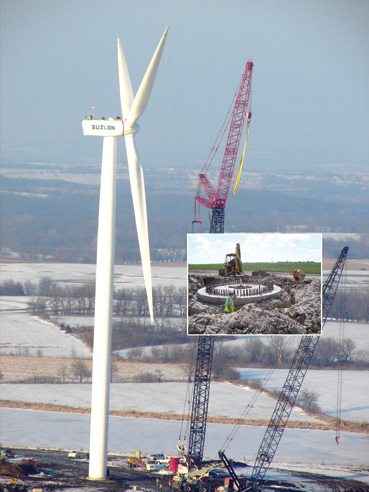 Cow Branch Wind Center - Atchison County, Missouri Construction of the wind farm began in 2007 and consists of 24 Suzlon S88s, with a total project size of 50.4 MW or enough renewable energy for 15,000 homes. Conception Wind Farm - Nodaway County, Missouri This 50 MW wind project will go online in late 2008. Loess Hills - Rock Port, Missouri Built on agricultural lands within the city limits of Rock Port, four Suzlon 1.25 MW turbines (5 MW) connect directly to the city's high voltage line, making Rock Port, Missouri the first community in America capable of meeting its entire annual electricity demands from wind power. Buffalo Creek Wind Farm - Franklin County, Iowa The 200 MW wind farm was sold to Interstate Power and Light Co. (IPL), a subsidiary of Alliant Energy Corporation. The first 100 megawatts of wind-generated electricity are projected to come on line by 2010. The Rock Port project is truly one-of-kind. "It's different from other communities that make similar claims of using green energy," says Carnahan. "In Rock Port, the electrons generated from those wind turbines are literally powering that town. And on most days it will be a net exporter of wind." In most cases, small projects like Rock Port aren't feasible. "The smaller scale means the fixed costs have to be spread through a smaller number of megawatts," explains Carnahan. "But it worked out here because we were working on another project just a few miles down the road. So we had cranes mobilized and crews out there-it was something we could piggyback pretty easily." None of WCG's projects have been the same. In the short time they've been in the business, they've worked with cooperatives, municipal utilities, and investor-owned utilities. Carnahan says the company wants to maintain that flexibility to be able to adapt to both the needs of the off-takers and the communities. And anyone at WCG will tell you that first and foremost WCG is about connecting with the communities. "Obviously we have to produce projects that make a return for the investor and this needs to be a profitable venture," says Carnahan. "But when you distill it down to what we're all about, we're about making a positive impact on these rural communities." Rural communities, he says, are looking for clean, renewable energy and steady energy prices, which wind energy can provide. And they also want good jobs and better schools, and companies that are committed to helping the community grow in a positive way. "We've been successful in doing all of those things," says Carnahan. WCG has relied on a number of local employees and local subcontractors. And when construction of one of the projects is taking place in a small town it's noticeable. "There's a buzz in the coffee shop and a line at the gas station. That's not something these towns are used to." By focusing on positively impacting rural communities, it's been good for everyone. "It's good for them. It's good for us. It's good business," says Carnahan. The company has over 2,000 MW of development in the pipeline in a dozen states. And with that much activity, Carnahan sees the company continuing to grow. "We're already looking for more office space for the second time. And we are hiring people very rapidly. I suspect we'd probably double in size again this year." To date, the general contractor on WCG projects has been Alliant Energy Wind Connect. And although all of WCG's existing projects or those under construction have used turbines through John Deere, WCG is actively talking to a number of other sources to supply projects coming up in the next couple of years. One of the growing pains of this kind of business has been coming quickly to terms with document management. "You've got projects with hundreds of landowners, and lots of individual correspondence and contracts, and title work...things like that. And you pretty quickly have to come up with organizational systems. That's something that we've put in place to make sure we can effectively communicate with our local partners." Carnahan doesn't want to see the company grow just for the sake of growth. "My goal is to do whatever we're doing very well. That may mean remaining the size that we are, or it might mean going out and seeking outside capitalization and growing it more significantly. I just want us to do what we're doing as well as possible." And that means never outgrowing their commitment to communities. WCG intends to keep community at the core of their values no matter how large they become. "All wind projects are going to be done in rural communities-the question is how are you going to treat them and interact with them?" says Carnahan. "We're going to use principled development practices and grow our reputation for keeping our word and exceeding expectations with the communities that we work with." In just three years, the man some thought was crazy-with comparisons drawn to Don Quixote-no longer has to prove his case. Carnahan has not only brought wind farms to Missouri, his company has become one of the country's fastest-growing independent developers of wind energy. He's excited about touting the benefits of wind. "It seems to scale easily. We've got a lot of it in the U.S. And I think in the short term wind energy will lead the way among the renewables as far as installed megawatts. "A lot of things are converging and that leads me to believe that this is a very good sector for the foreseeable future. I'm eager to be a part of it and to be a leader in it."